Named after Adolph Strecker (1822-1871), the Strecker degradation is a reaction between an alpha-amino acid and a dicarbonyl (usually produced through the Maillard reaction) and has been well studied in food chemistry as it produces volatile flavour compounds in many products that undergo Maillard browning. 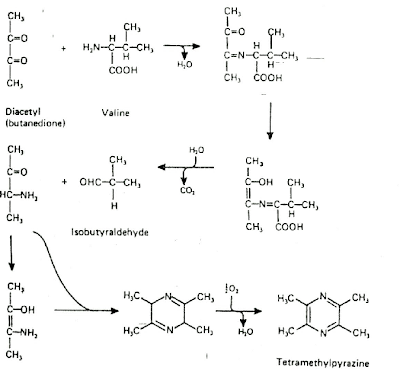 An example of the Strecker degradation between diacetyl and valine is shown below. As can be seen, a product of the Strecker degradation is an aldehyde corresponding to the amino acid (isobutyraldehyde in this case). Early studies on volatile flavour compounds in cheese also found aldehydes with structures that were obviously related to amino acids and the assumption was made that these compounds also originated from the Strecker degradation since that reaction had been well characterised in the context of other foods. However, later work has shown that amino acids in cheese are catabolised by other pathways, some of which produce aldehydes. The crucial step in the catabolism of most amino acids in cheese during ripening is catalysed by enzymes known as aminotransferases, principally from starter organisms. 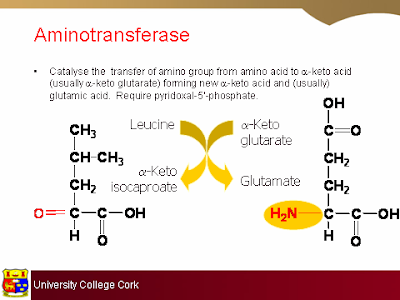 The co-substrate usually used by aminotransferases is alpha-ketoglutarate and thus the products of the reaction are glutamic acid and an alpha-keto acid corresponding to the original amino acid. These alpha-keto acids then degrade by various reactions to yield a range of volatile flavour compounds. Amino acid catabolism is perhaps the most important series of reactions for the production of volatile flavour compounds in many ripened cheeses. Ardo, Y. (2006). Flavour formation by amino acid catabolism. Biotechnol. Adv. 24, 238-242. Yvon, M. and Rijnen, L. (2001). Cheese flavour formation by amino acid catabolism. Int. Dairy J. 11, 185-201.